you know the deal: fashion week requires some statement-making looks; and for this round, i had a lot of fun putting together—and, of course, wearing—my outfits for the four-day event, but i think this one wound up being my favorite. check it out. wearing: asos man mesh t-shirt, marc jacobs shorts, balenciaga speed trainers, herschel supply fanny pack, nous deux cap. i've really been into suits these past few months. solids, prints, patterns... they're all really amazing tools to have in your style arsenal. naturally, i wear mine in super casual ways, but they still make super strong statements. case in point: this look that i put together from bar iii. i linked up with them over the past three months to show how to give your summer style a dapper touch, and i'd have to say that this outfit is my favorite from the campaign. check it out. wearing: suit & hoodie from bar iii, balenciaga speed trainers, reclaimed vintage cap, regal rose chain necklace. so... i officially believe in love at first sight. i believe because i've experienced it, but maybe not the way you think: it's with a pair sneakers. if you know me well, then you know i don't wear a ton of obnoxiously expensive stuff—i'm into looks way more than labels—but every now and then, i treat myself to a little gift. meet balenciaga's speed trainers. wearing: balenciaga speed trainers, stefan grant t-shirt, 3.1 phillip lim belted shorts, reclaimed vintage baseball cap, frames by ray-ban. wearing: maniere de voir suede biker jacket with chain detail, distressed zipper jeans, t-shirt & cap, asos man ring belt & creepers. like the look? get it here. wearing: stussy falcon print shirt, asos man tank, dr. denim otis cropped straight fit jeans, vans black ball sf sneakers, reclaimed vintage cap, ray-ban frames. i have a few key looks in mind for the ss17 season, the first of which you'll find throughout this post. easy, breezy button-downs, a clean tank and the right pair of denim make an easy style combo that'll get you through the hottest of days looking hella fresh. i prefer to keep mine either barely-buttoned (translation: a three-button max, starting from the bottom, of course) or all the way open to increase the cool factor (no pun intended, although it works). the print on this shirt from stussy had me all caught up as soon as i laid my eyes on it, and it really does all the work. i just had to worry about seeding in the right pieces around it, and that was no difficult task: light-washed jeans, a sick pair of frames, one of my favorite caps, and a white-on-white combo from the ankles down. wearing: asos man velour chevron tee, topman tapered jeans, forever xxi biker jacket, puma basket tech sneakers. reasons this tee is amazing: 1) the chevron striping, 2) the collar piping, 3) the comfy velour texture, 4) that strong color. there you go, four solid reasons why this bad boy will definitely be one of my SS17 statement-makers. for this look, i styled the tee with a matching burgundy biker jacket and kept the overall palette on the dark side with a pair of faded black denim. color has always been a big thing for me, especially when it comes to putting a look together. hues that don't flow or balance each other out make me uncomfortable (which is why you'll rarely ever see me wearing random, wacky combos). now, don't get me wrong, i'm a fan of skillful color-blocking; and if you're one of those people who hates anything "matchy-matchy," no problem. but as for me and my wardrobe, i need a certain level of coordination. case in point: this spring-ready 'fit i threw on this morning. wearing: asos man zip-neck tee with retro paneling, river island cropped trousers, vans authentic dx sneakers in tan. this one all started with the shirt, which gives the look a small, but solid pop of yellow—muted just like I like it, and still perfect for the sunshine. from there, i pulled out a couple of easy neutrals that complemented the top half, but didn't compete. and thankfully, i found the perfect spot at the last minute to shoot it. the end result: a color palette that i could definitely get used to this season. so, after about a week of amazing weather, mother nature went and threw a cold curve ball our way. while i'm sure it's only temporary at this point, i'm not mad about the chance to break back out this boss coat from maniere de voir. wearing: maniere de voir fur-lined coat in black, side seam lace-up t-shirt, destroyed jeans and chelsea boots. while it's been a see-saw of extreme weather conditions here in nyc, i'm happy to say that brighter (and warmer) days are definitely in sight. with that said, i think we can finally go ahead and begin our transition toward spring-appropriate threads. the trickiest part always comes down to layering, and i found a sweet in-between piece from maniere de voir. wearing: maniere de voir shearling lined jacket, new york t-shirt, double ripped jeans and chelsea boots. while the lining details are on deck to keep me protected against the breeze, the best thing about this shearling is the weight. it's super light, which is perfect when the sun creeps up out of nowhere. 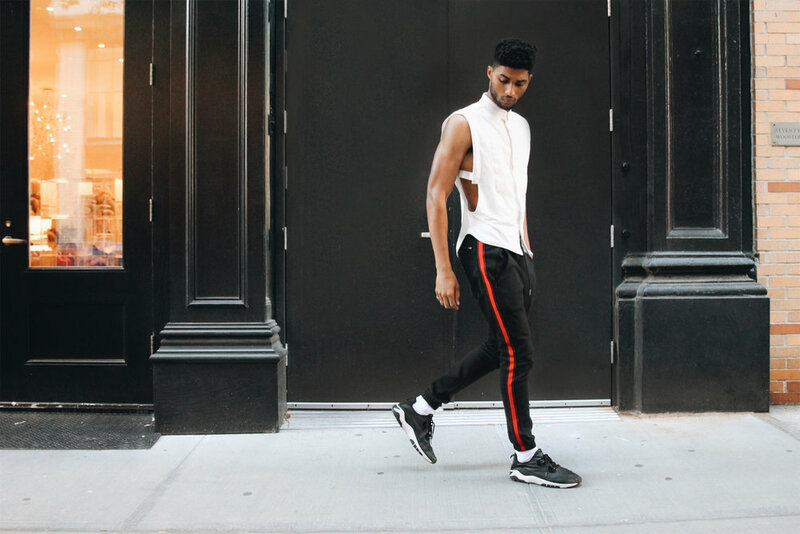 here, i threw it on over a tee and hit the streets for an easygoing look that's simple but effective—especially when you glance at those fire chelsea boots. click here to shop the jacket now (psst... it's on sale). wearing: h&m wool-blend casual blazer, ports 1961 #followme tee, asos man distressed jeans and rope belt, dr. martens bandana print brogues. in moments like these, the easiest thing is to blend your elements: mix dressier staples with laid-back basics for a fun combo. here, I paired a relaxed blazer with a simple tee for my personal approach to biz-casual. for the bottom half, I matched (very) distressed denim with a statement-making pair of brogues—both of which added some extra cool points, while still working together with the rest of the 'fit for a solid head-to-toe ensemble.